The price of oil at $ 200. Forecasts "official" price of oil have often shared their optimism. These forecasts "official" ones of the EIA (Energy Information Administration) are those that followers of forecasts "mathematics" (or spells) prefer to use in their model. The EIA was established in 1977, between the first two oil shocks of 1973 (rising prices from OPEC) and 1979 (War Iran / Iraq) to collect data on energy (coal, oil, natural gas, electricity, renewable and nuclear energy). The EIA is part of the U.S. Department of Energy (U.S. Department of Energy). In 1996, the EIA provided a barrel of oil in 2012 between a minimum of $ 15 and a maximum of $ 35 (+ / -). 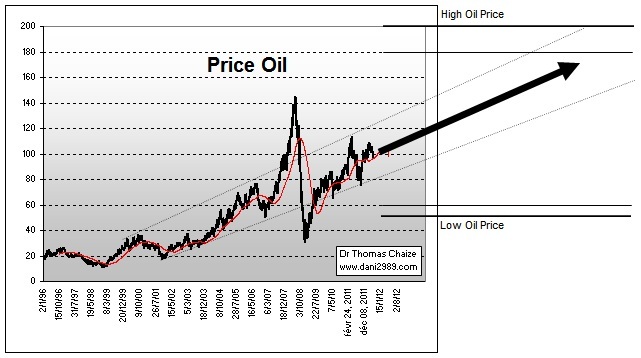 In 2000, the price forecast for 2012 ranged from a minimum of $ 15 and a maximum of $ 30 (+ / -). In 2005, the price forecast for 2012 ranged from a minimum of 25 dollars and a maximum of $ 40 (+ / -). In 2008, the price forecast for 2012 ranged from a minimum of 50 dollars and a maximum of $ 85 (+ / -). Gradually, as the deadline got closer, the forecast has adapted to the rising oil prices. But things seem to have evolved in this institution this year, they plan for 2035, a low scenario to 60 dollars and a high scenario at 180-200 dollars (+ / -). 2035! I hear you say, it's far! True, but in their chart, they indicate that this price range is also possible in a relatively short time horizon, at 1, 2, 3 years. This forecast may be optimistic for 2035, seems however quite adapted to the horizon of 1 to 3 years. Indeed, it seems highly likely that oil in a major structural trend upward knows very volatile at the discretion of the crises that are sure to punctuate his rise to new heights. The quotation from John Davison Rockefeller, dating from the 19th century, however, is more relevant than ever: "Believe in oil, fall is not a reason to fear, but an opportunity to buy." Today the oil down, I have no idea of ​​the level to which it goes down ... $ 92.5, $ 85, $ 75, $ 65, whatever! I am convinced that it will not be a reason to doubt, but a buying opportunity. We know it will go up, because to keep global production at this level, high oil prices, very expensive or even necessary. It's not a conspiracy of attendants, traders, hedge fund, is a structural trend predictable and inevitable. Oil is expensive because we are every day more and more that there is enough oil. You can return the problem in all directions, using incantations, "shale oil", "Greek crisis", "speculation" this or nothing will change! These are two world views and our future that have been rivals for 10 years. One who is to say that the earth is flat, oil abundant vitam eternam, as oil prices remain quietly at the desired level: they are usually economists, if you have one handy, talk to them about the future oil prices, it is worth its weight in "peanuts."